Br. Matt is from Covington, KY, and he entered the Franciscan Order of Friars Minor in August of 2017. I had been discerning a call to the religious life or priesthood ever since I was in grade school. I didn't feel, however, called to be a diocesan priest. I didn't become familiar with religious orders until after college, but I have felt a consistent call to social justice work. I was a Public Defender for the Commonwealth of Kentucky for 13 years representing poor people charged with crimes who could not afford private legal counsel. The many challenges and rewards of that work reawakened my desire to deepen my own spiritual life and use my skills and talents for the greater glory of God. 2) How long have you been with the Franciscans? 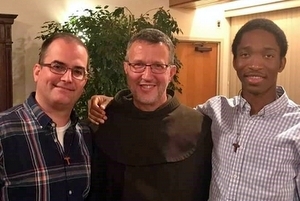 I became a postulant with the Franciscans in August of 2017. Franciscan friars are men, both brothers and priests, who are inspired by Saint Francis and called to live together in community in poverty, chastity, and obedience. Not all of the brothers desire to be ordained priests. 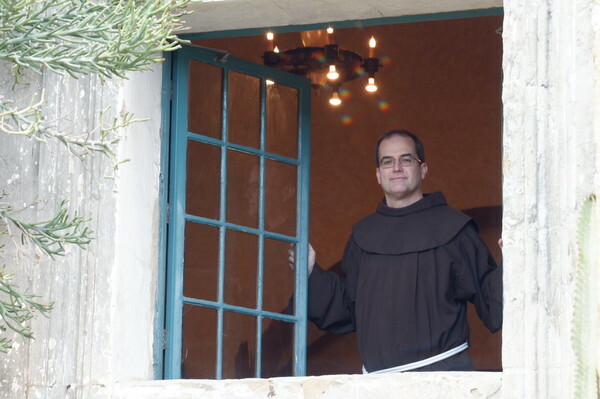 During postulancy, I lived with 14 other men considering the Franciscan way of life, along with our formation team and some friars in residence. We performed ministry work three days per week and attended lectures and workshops on the other days during the week. Our postulancy year ended May 27, 2018. 3) What does a typical day look like for you? On July 16, 2018, I arrived at the Old Mission in Santa Barbara to begin my novitiate year. Our year this year is more contemplative and cloistered. We novices remain at the mission except for unscheduled time on Saturdays and our ministry day, unless we have permission to leave for specific appointments or events. We have morning and evening prayer in chapel together during the week. We attend Mass every day and have our meals in common. Br. Matt with Provincial Minister Fr. 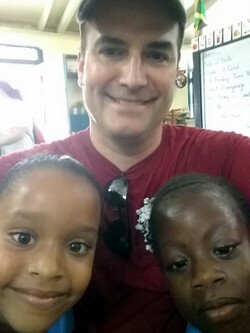 Mark Soehner and fellow Novitiate, Br. Raphail Ozounde. Throughout the year we have various lectures and seminars, and participate in retreats and workshops where we learn about the charism of St. Francis and the history of the order, sacred Scripture, and Vatican II documents, among the many topics. We novices only have ministry one day per week. Last fall I worked at St. Vincent's in Santa Barbara. St. Vincent's is a residential campus operated by the Daughters of Charity of St. Vincent de Paul that provides low-income housing units, early education, and family strengthening programs. I visited with residents in the morning and led an afternoon sing-a-long in the recreation room. I have a new ministry this spring at the Alpha Resource Center, which is a daycare facility for adults with developmental and intellectual disabilities. Mother Teresa is Br. Matt's favorite saint. I look forward to making simple profession on July 2, 2019, when I will vow to live in poverty, chastity, and obedience to the Franciscan Order for one year. I plan to renew those vows every year until I am canonically able to make a solemn profession for life. I believe I am called to the priesthood and God-willing will attend the Catholic Theological Union this fall in Chicago with my brothers. 5) Who’s your favorite Saint? My favorite Saint is St. 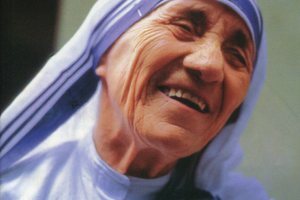 Mother Teresa of Kolkata. She was simple, hardworking, and unflappable. She was always listening, discerning, and pointing the way toward Jesus. Br. 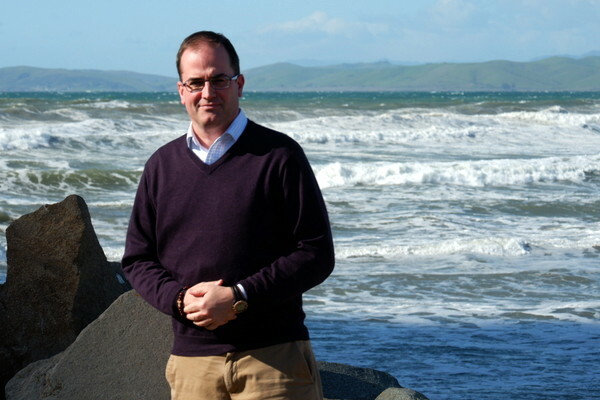 Matt at the Pacific ocean near the Franciscan Interprovincial Novitiate in Santa Barbara, CA.